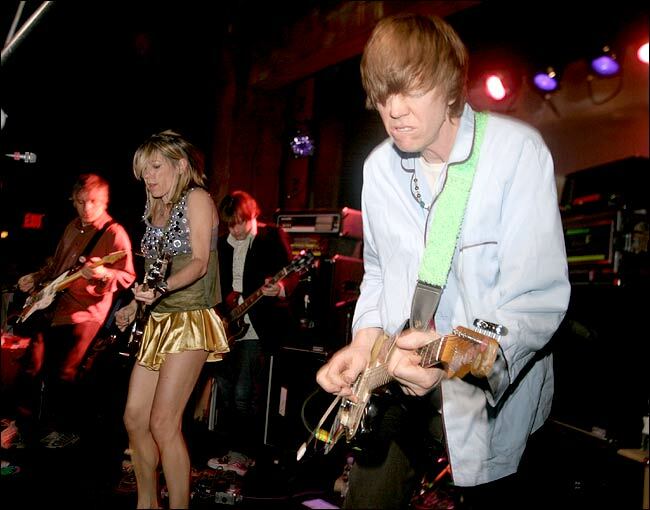 Kim Gordon is the bass player & singer for Sonic Youth. Kim was born in April of 1953 in Rochester, New York on the southern shore of Lake Ontario. Kim's mom was a seamstress. Kim was born in New York, but she grew up in Los Angeles. She went to the Otis College of Art and Design. After graduating, she moved to New York City and met two guys named Lee and Thurston. Thurston and Kim got married in 1984. Kim gave birth to their daughter, Coco Hayley, in 1994. Not only is she a mum and the bass player for Sonic Youth, she is also an established visual artist and curator. Her work has been exhibited across the U.S., Japan and Europe. In the early 1980's, Gordon wrote for Artforum and worked for several SoHo art galleries. Kim is an amazing woman; an icon, brash and enigmatic. Kim Gordon is our generations Rosie the Riveter. Kim is to underground music and culture what Rosie was to manufacturing plants that produced munitions and materiel during World War II. And this concludes our children's book about Kim. Kim & Vincent Gallo front row at a Marc Jacobs show. On not shopping at Forever 21, in solidarity with friend Anna Sui, who's suing them: “Oh no! Are they ripping her off? I just went there the other day with my daughter [grimaces and shrugs]. I’ve definitely bought a dress at H&M that looked a lot like Anna Sui. What can I say? It was really cheap.” HOLLA! Hey check out the fantastic and currently hottest reggae artist Ava Leigh who’s worked with the famous sly n Robbie, Nick Manasseh and future cuts. There is free music available at www.avaleigh.co.uk.